You might notice I didn’t put up a spoiler warning at the beginning of this review. Not that you want to know everything before you watch it, but this episode “Consumed” is told entirely in flashback, both recent and distant. If you’ve been wanting to know more about Carol’s (Melissa McBride) journey after Rick (Andrew Lincoln) kicked her out of the prison, and you’ve felt like Daryl (Norman Reedus) has been getting the short shrift, then this is the episode for you. 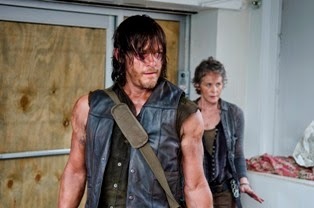 Daryl gets something to do – Daryl has pretty much been treated as a foot soldier this season. He’s ready to fight and he always comes through in the clutch. But ever since Daryl became more social, he’s been less interesting. In the first two seasons Daryl was downright disagreeable and anti-social, but every once in a while we got those little glimmers of humanity. It made us wonder what made Daryl tick and if he would ever come out of his shell. Once he finally warmed up to everyone he kind of faded into the background. Here we got to see him take charge and I liked that they brought back his troubled childhood. 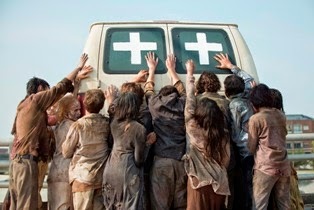 Now if they can only do something with Michonne (Danai Gurira). 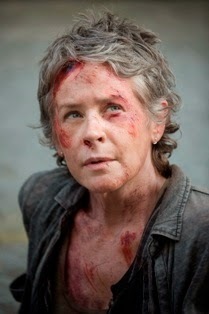 Carol is emotionally conflicted – In season one Carol seemed like clear walker bait, yet here she is. Not only has she survived, but like Daryl, the post-apocalyptic world has brought out qualities she didn’t know she had, both good and bad. She’s a survivor, but at what cost? Carol wonders if her life has real meaning and if taking the lives of others is worth her own survival. Fire was used throughout this episode to symbolize the layers of her old life being burned away, an though a bit heavy handed, I liked that they were exploring the human condition in this episode. 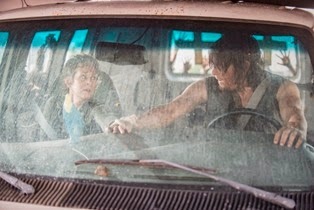 Riding the van over the bridge – Carol and Daryl jump in a van precariously teetering on the edge of an overpass and let it fall to the street below. Okay, this totally wouldn’t have happened this way, but it reminds us that this show is set outside of reality, based on a comic book, and ultimately is entertainment. 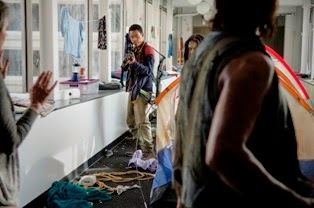 Urban campers – A haunting visual reminder of the desperation people faced in the early days of the outbreak and that walkers around any and every corner. What’s creepier than a writhing sleeping bag? 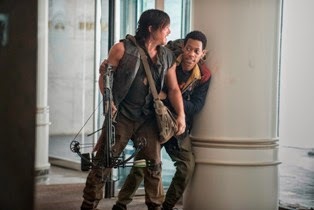 We also found out that Noah (Tyler James Wiliams) hooked up with Daryl and Carol here and their first meeting wasn’t exactly a good one. Morley Cigarettes – A cool reference to X-Files! – Though I don’t think it’s all that cool that Daryl smokes. He should quit! This episode didn’t further the storyline – I’m all about character development, but I think it can be done while pushing the story forward. So far this season hasn’t developed an overall story arc, and this one seemed to specifically fill time while we wait for everyone to get back together for the final two episodes before the break.